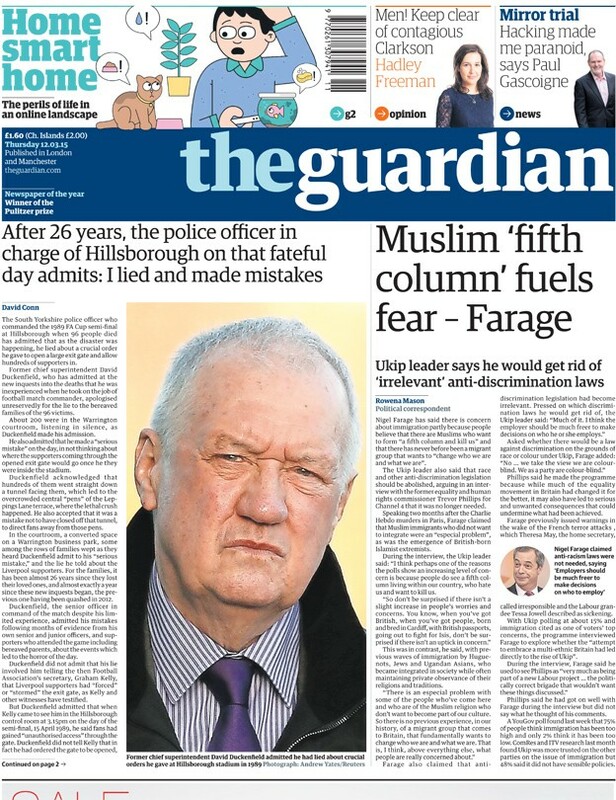 The Guardian and Independent front pages yesterday reported on comments Nigel Farage is said to have made in a documentary fronted by former chair of the Equality and Human Rights Commission, Trevor Phillips, and due to air on Channel 4 next week about scrapping race discrimination legislation in the UK and referring to Muslims as “fifth columnists”. The comments, taken from a press release issued by Channel 4 about the documentary, show Farage responding to questions about race discrimination legislation in the UK and whether UKIP would maintain it. 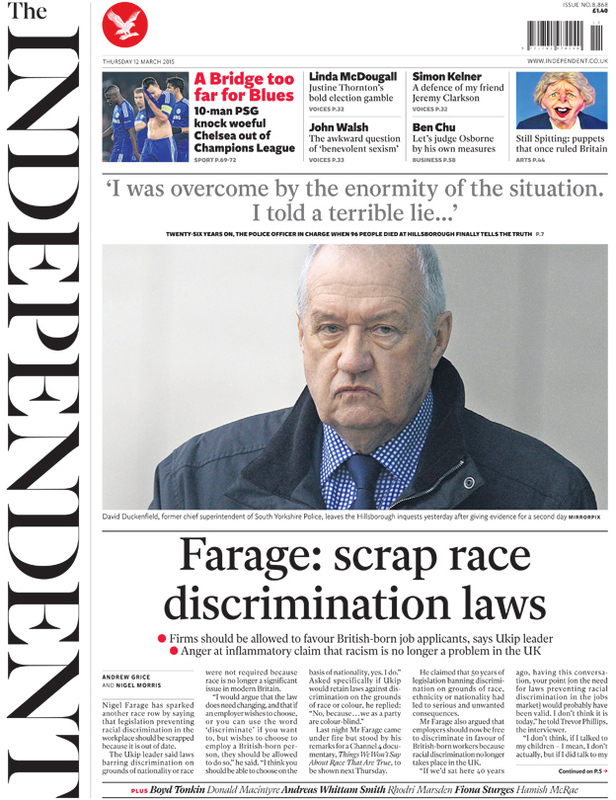 Farage’s comments on scrapping “much” discrimination legislation comes as the Labour Party yesterday revealed long term unemployment among BME youth rose 49% since 2010 and a report at the end of last year showing British Muslims faced the highest level of job discrimination of all groups. It would be interesting to see how Farage’s “colour-blind” orientation and removal of “much” discrimination legislation would do to reverse these trends. 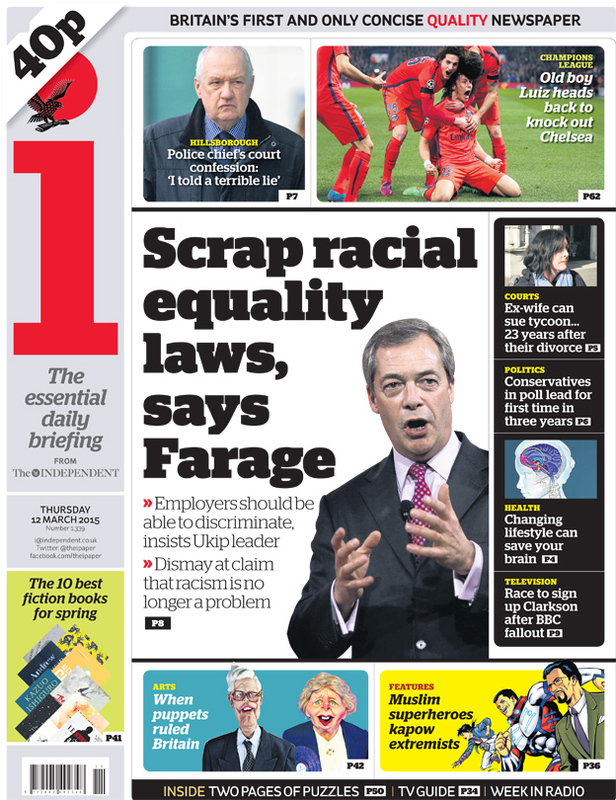 Interesting to note too that Farage’s comments coincide with the publication by the London School of Economics and Manchester University of a report on The Changing Anatomy of Economic Inequality in London (2007-2013). According to the report, Muslims were more likely to be classified as long term unemployed in 2007/08 in London and in the rest of England, and in the rest of England in 2012/13, coming second (to Buddhists) in London. With the level of discrimination faced in the workplace on grounds of race and/or religion, it is difficult to see how targeted interventions could happen when a “colour blind” policy glossed over groups disproportionately affected. Farage’s comments about Muslims being a “fifth column” is remarkable given survey data on the level of Muslim identification with British identity and British national institutions. Farage also adopts a rather simplistic mode of explanation for radicalisation and foreign fighters suggesting this is a problem of lack of integration not, as many other researchers have pointed out, often those who have gone on to commit terrorist atrocities have evinced all the usual signs of being integrated. There also appears no admission, as others have argued, of the role played by Britain and foreign wars or domestic policy, in creating an environment genial to the degree of disaffection that renders individuals vulnerable to radicalisation.